You'd think that Google's big press event was today instead of October 4, but no, we're just being treated to another leak of the company's new phone a week early. The smaller Google Pixel just showed up in an unofficial press render, courtesy of Venture Beat. It looks exactly like the HTC-made phone with a 5-inch screen that's been teased for months. There's nothing extraordinary about the Google Pixel design so far. The front looks like the Nexus 5X, while previous leaks have teased a more premium glass back. Goodbye, Nexus plastic. The Pixel's specs are a non-surprise, too: a 1080p display, quad-core processor clocked at 2GHz, 4GB of RAM, 32GB of internal storage and a 2,770 mAh battery. Expect a 12MP camera on back, with a 8MP camera on the front. What does the Google Pixel XL look like? There are no new Google Pixel XL photos to go along with it, but we've seen side-by-side pictures of the two phones as part of past leaks. It looks like a bigger version of the standard-sized Pixel. It's supposed to have a 5.5-inch display at a superior 2K resolution, a bigger battery at 3,450mAh battery and a speedier CPU that some believe will be the Snapdragon 821. Neither phone will deliver a groundbreaking, fresh design along the lines of the elegantly curved Samsung Galaxy S7 Edge, but the Pixel line could usher in a new era of virtual reality with Google Daydream VR. 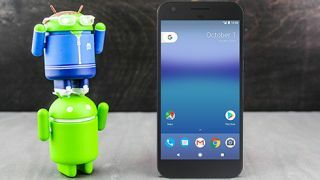 Keep it locked to TechRadar for full details about the Google Pixel and Pixel XL on October 4, as we'll be in San Francisco to see the official unveiling at the highly anticipated press conference. Can it beat the iPhone 7 and iPhone 7 Plus?